When even the experts are warning that prices for works of art have become obscene, it is probably time to run a dispassionate eye over the multimillion-dollar frenzy for certain works. Last week, Nu couché (sur le côté gauche) by Amedeo Modigliani sold to an unnamed buyer for $157m, and a new record was set for a David Hockney painting when Pacific Coast Highway and Santa Monica was bought for $28.5m. The price reached at the Modigliani auction reflects the state of the world economy, says McAndrew, who also compiles an annual study of the global art market with Art Basel and Swiss bank UBS. Stronger growth is fueling the market, spiraling prices reflect rising rampant and rising inequality across advanced economies. The art market broadly matched the growth rate of the global economy between 2000 and 2017, according to the latest Art Basel and UBS report, with world GDP and wealth both rising last year. Even so, some paintings are so famous they can fetch dizzyingly high prices when the economy is in a downturn. Simple economics suggest the price of an artwork is determined by how much a buyer is prepared to spend and what a seller would accept. The cold equation of supply and demand also means the death of an artist – immediately limiting their output – raises the value of their work. But unlike widgets, whose value can be calculated by looking at rates of production and demand from consumers, there are myriad intangibles in the world of art. Any price tag at all can seem jarring for a creative medium where consumption is an issue of taste, not necessity, and the motive for the work is, ideally, creative expression, not financial gain. Obviously, some artists play the market. Purists have objected to Damien Hirst’s production-line techniques, and Andy Warhol turned the idea of authenticity upside down with his screen prints. Yet works by both artists have retained their value. Gustav Metzger, who died aged 90 last year, was revered for his auto-destructive art: he sprayed acid on canvas to cause damage over time, defying the notion of long-term commercial value. For the most famous artists, the sums can be huge. With its $450m price tag six months ago, Leonardo da Vinci’s Salvator Mundi remains the most expensive painting ever sold. Thirteen Picassos were bought for $155m over two days in February by one art consultancy, while the overall value of global fine-art sales rose by 12% to $63.7bn last year. Experts say the finest works rarely come up for sale, yet demand is increasing as newly wealthy Chinese buyers compete with financiers and Saudi sheiks. Nu couché (sur le côté gauche), painted in 1917, three years before Modigliani’s death at 35, is one of the Italian painter’s largest works, and one of only five of his nudes ever to come up for auction. It was last sold in 2003, for $26.9m – reportedly to the Irish horse breeder John Magnier at Christie’s. This would appear to make fine art a surefire winner for wealthy investors. But the market has crashed before, most spectacularly after Japanese buyers acquired half of all the impressionist art put on the market in 1990. The bubble burst a year later when Japan’s economy crashed after an unsustainable property boom. Today, hedge fund billionaires and wealthy Asian investors trade canvases like stocks, bonds or commodities – mirroring a trend for the hoarding of fine wines, where crates of vintage red can be left unopened for decades, then sold at higher prices. Mega sales may boost egos in the City but the Modigliani sale alone could put at least 10,000 students through a year of art school in the UK. Western Australia’s $300 million state art collection is at risk of damage or loss thanks to a lack of storage space and appropriate conservation, an auditor-general’s report has found. The report, released today by acting auditor-general Sandra Labuschange, said the collection was at risk because of “storage, conservation, and monitoring issues”. It found the Art Gallery of Western Australia (AGWA), which manages the collection, does not know where all its works are stored nor what condition they are in. This is because its database is poorly documented, key records are incomplete and there has been no stocktake since 2010. But AGWA director and chief executive Dr. Stefano Carboni said there were only 10 items out of the near-18,000 works that did not have a location recorded in the database. The report also noted problems with storage. “AGWA struggles to balance its responsibilities to grow and also preserve the state’s $300 million art collection,” the report stated. The report found many examples of overcrowded storage areas and art being stored in aisles and walkways. Ms. Labuschange said the findings were a serious concern. “We have a $300 million asset of the state which isn’t being properly conserved and looked after,” she said. She said the report did not consider any works that may have been damaged as a result of storage management. Dr. Carboni said he accepted the findings in a “general way”, especially the issue of storage, which he said he had been reporting for years to the board and the State Government. “This is not new,” Dr. Carboni said. “I am not aware of any museum that doesn’t have storage issues, the database is always a difficult beast. Dr. Carboni said no artworks had been damaged or were “at risk” currently because only specialized people could access the storage areas. Dr. Carboni said the audit was a good opportunity to push for improvements, especially with the storage issue. The collection is kept almost entirely at the AGWA building at the Perth Cultural Centre. 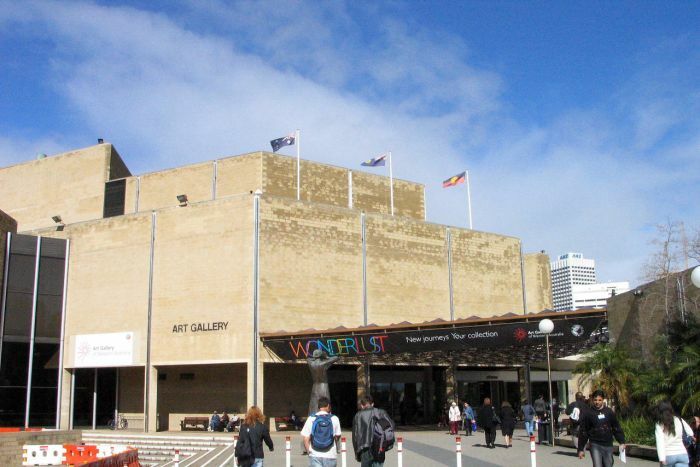 It is home to almost 18,000 works from WA, Australia, and international artists. The audit report identified 99 artworks that needed treatment more than seven years ago. It is unclear whether these works have been treated. “Establishing a plan is particularly important given the limited resources AGWA has available to carry out this work,” the report found. The report praised the way the gallery had attracted visitors over the years but said more needed to be done to reach a regional WA audience. A number of recommendations were made, including fixing the lack of storage space, making artwork more accessible and steps to better manage and maintain the location and condition of the collection. “While fixing the issues will not be easy in a time of restrained government spending, the AGWA staff we met showed a dedication and passion to finding ways to address the issues,” Ms. Labuschange said. In its reply, AGWA accepted the findings on the need to improve the care and management of the collection, and the need to broaden its access. It said it recognized the “critical” need for additional storage and was working with the Government to find a “speedy” offsite solution. AGWA said there was scope to improve its recordkeeping and it was working to implement improvements to its system. It said it was working to develop an improved stocktake system and “control” of artworks by June 2019. AGWA said it was working on a three-year pilot program to tour “more high-quality visual arts exhibitions” to regional communities. A former Sedalia resident has reportedly confessed to stealing Civil War antiques from the Pettis County Museum, causing a nationwide search for multiple lost items. The Sedalia Police Department has submitted a charge of stealing against Terry J. Cockrell, 38, of Coffeyville, Kansas, to the Pettis County Prosecutor’s Office. A Pettis County Circuit Court judge could issue a warrant for his arrest, should Prosecutor Phillip Sawyer file the charge. Cockrell volunteered at the Sedalia museum for several years before he moved away last fall, according to a press release from SPD detective Jill Green. He had access to the museum building and the objects on display. On March 24, museum co-curator Charles Wise reported several Civil War era items were missing, including a cap and ball musket rifle, a sword, a surgical kit, and a brass-barrel Blunderbuss firearm. The items have a value of several thousand dollars, meaning Cockrell’s charge could reach felony status. After an internet search, Wise found a Tennessee Civil War collector, Rafael Eledge, had the missing items displayed on his website. Eledge provided documents from his purchase of the antiques that tied Cockrell to the theft, according to the press release. Cockrell reportedly told Green he stole the items and sold them to the collector. Eledge, who had no knowledge the items were stolen, purchased the antiques in June and has since resold them to buyers across the country. Adrienne Harris, a Baylor University associate professor of Russian, holds “Bogatyrs,” an art print that was stolen from Old Main, then returned. Three incidents of artwork theft from a Baylor University academic building prompted the department of modern languages and cultures to remove more than 90 replica paintings from its walls. Although two of the three pieces were anonymously returned this weekend, Baylor officials are unlikely to reset the aesthetic in the historic Old Main without heightened security. The first painting was reported missing in January 2017, and another went missing in December, university spokeswoman Tonya Hudson said. A third was reported missing March 28. Hudson said the second and third stolen paintings were left propped up against an exterior door to Old Main on Sunday, but Baylor police do not know who took or returned them. The stolen property is worth less than $1,000, and police are still searching for the first piece. The crimes would likely be Class B misdemeanor theft of property. A sign in Old Main at Baylor University notifies students the artwork has been taken down because of a third theft in the last 14 months. Two of the stolen pieces have been returned, and officials are considering new security measures before returning the art to the walls. The department’s interim chair, Michael Long, said each piece in the building corresponded with faculty members’ areas of study. The artwork is now stored in an undisclosed location. Long said he has discussed security enhancements with Baylor police. By the fall semester, the school may install cameras and anchor the prints to the wall, he said. Officials also said news reports about the thefts, including a Baylor Lariat article published on Thursday, may have motivated someone to return the prints. A replica of the 1898 painting, “Bogatyrs,” by Viktor Vasnetsov, was taken from Old Main at Baylor University but returned on Sunday. One of the stolen pictures returned Sunday was a print of “Bogatyrs,” a depiction of three knights by the Russian artist Viktor Vasnetsov created in 1898. Adrienne Harris, an associate professor of Russian, said her students were upset to learn the piece had been taken. The thief or thieves were probably unaware of its cultural significance, she said. “The painting itself is part of the national revival of the 19th century when Russian artists and authors were very much interested in folklore,” Harris said. Judge Arthur Tompkins has become a world-leading authority on art crime. Stealing beautiful art is an ugly business. That’s according to Judge Arthur Tompkins who, by day, presides over cases in the District Court – everything from criminal to civil suits – but, in his spare time, turns his attention to art. More specifically, art crime. In the past decade, Tompkins has become a leading authority on crimes involving artistic masterpieces. He co-founded the New Zealand Art Crime Research Trust, travels to Italy each June to teach the Art in War component of the Association for Research into Crimes Against Art (ARCA) annual postgraduate programme and has contributed to and edited books about art crime. His own book, Plundering Beauty, will be launched in New Zealand this month. It’s subtitled A History of Art Crime During War, reflecting his area of interest. Based on his lecture notes, the book covers 2000 years of wartime art crimes, from classical antiquity through to contemporary conflicts in Afghanistan and Iraq. In many conflicts – the Crusades, the Thirty Years’ War, Revolutionary and Napoleonic France, and World I and II – art has been stolen or destroyed, becoming a weapon in the wider fight for hearts and minds. Tompkins says art is part of the shared heritage of humankind and to take it, desecrate or destroy it – as the Taliban did with the Buddhas of Bamiyan – is to strike at the very heart of a culture and what it may hold sacred. Judge Tompkins’ book Plundering Beauty will be launched in NZ this month. Outside wartime, he says a belief has developed that the perpetrators of art crime are urbane thieves interested in masterpieces because of their beauty. In fact, art is frequently damaged when it’s stolen by thieves who are looking for something that’s relatively easy to transport, often to use as collateral for loans to buy drugs or weapons. Tompkins says though art might be easily transportable, it’s not easy to sell legitimately and more opportunistic thieves, realizing what they’ve taken is so recognizable, may instead seek a ransom. A year after two rare $1 million paintings by Gottfried Lindauer were stolen during a ram-raid at Parnell’s International Art Centre, Tompkins has no idea why these artworks were stolen or what could have happened to them. “It could cover the whole spectrum [of why art is stolen] between an opportunistic theft to a commissioned one,” he says, adding that there’s probably a lot more art crime in NZ than we realize. The opportunity to research art crime and teach followed a chance meeting in a Parisian bar 10 years ago. It wasn’t just any old bar but one at Interpol’s General Secretariat in Lyon, France where Tompkins was at a conference on forensic DNA. He struck up a conversation at the bar, thinking he was talking to a fellow conference attendee, but the man worked for Interpol’s Stolen Art Unit. On the long flight home, Tompkins realized a several of the issues he was working with Interpol on – cross-border laws and the interaction between different countries’ legal systems – were relevant to stolen art. Waiting for a jury to return at Kaikohe District Court, he looked up more on Interpol’s website about art crime and learned of the Association for Research into Crimes against Art. Contacting its founder, Noah Charney, he was invited to write a chapter for a book of art crime essays he was editing. The following year, he was in England and figured he might as well travel to Umbria, where ARCA’s first Art Crime Conference was on. There, he got an invitation to return in 2010 to teach the Art in War course and has been back every year since. The Four Horses of San Marco. • Tompkins’ favorite piece of stolen art: The Four Horses of the Basilica San Marco — taken from Rome to Constantinople around 400-500CE, then from there to Venice by the Fourth Crusade in the opening years of the 13th century, then to Paris by Napoleon, but back again to Venice after a mere 17 years. They are the only surviving cast quadriga (a chariot drawn by four horses) from the Classical World and it’s extraordinary they’ve survived at all. They were moved from their centuries-old home above the main door to the Basilica, looking out across the Piazza San Marco in Venice, in the 1980s to much-reduced circumstances inside a small museum upstairs in the Basilica. But they are still a charismatic and haunting and astounding artwork. • Stolen but recovered: Leonardo da Vinci’s Mona Lisa — she of the enigmatic smile — hangs in the Musee du Louvre in Paris and is impossible to value. The painting was stolen in 1911 and the Louvre closed for an entire week as the theft was ineptly investigated. It was returned to the Louvre three years later after the thief, former Louvre employee Vincenzo Peruggia, tried to sell it in his native Italy. He’d kept the painting in a suitcase in his Paris apartment for much of the time he’d had it, taking it out occasionally to gaze at. • Stolen and still missing: Poppy Flowers (also known as Vase and Flowers or Vase with Viscaria) was painted by Vincent van Gogh in about 1887 possibly as a tribute to an older artist, Adolphe Monticelli, whose work influenced van Gogh’s. Though the painting is relatively small, it’s believed to be worth about US$50 million. It was taken from the Mohamed Mahmoud Khalil Museum in Cairo in 2010 and, remarkably, had already been stolen once before in 1977 but recovered 10 years later. It remains missing, despite a substantial reward on offer for its recovery. Gustav Klimt’s Portrait of Adele Bloch-Bauer. • Plundered by the Nazis but returned 70 years later: Gustav Klimt’s Portrait of Adele Bloch-Bauer was the star of the Helen Mirren film Lady in Gold. Painted in Vienna in the early 20th century, it was taken by the Nazis at the beginning of World War II and ended up in the Galerie Belvedere in Vienna after the war. There followed the long obstruction of its return to owner Ferdinand Bloch-Bauer’s heirs by the Austrian state and the Viennese art establishment. Its return after arbitration and its ending up back on public display in New York is just recognition of the injustice done by its theft. The Lady’s long story is a remarkable tale that epitomizes much of the history of art crime during war. The golden frame is all that remains of Solomon J. Solomon’s Psyche, stolen from the Robert McDougall Art Gallery in Christchurch. • Local mystery: Stolen from Christchurch 75 years ago and still badly missed: Solomon J. Solomon’s Psyche. This large, typically Victorian, painting exists now only in black and white photographs. It was taken during an overnight burglary of the Robert McDougall Art Gallery in Christchurch in June 1942, with the frame and the stretcher left behind. Psyche had originally been purchased by the Canterbury Society of Arts in 1907, during Christchurch’s 1906-1907 International Exhibition, and donated to the Robert McDougall Gallery in the early 1930s. The painting has never been seen since that fateful June night.